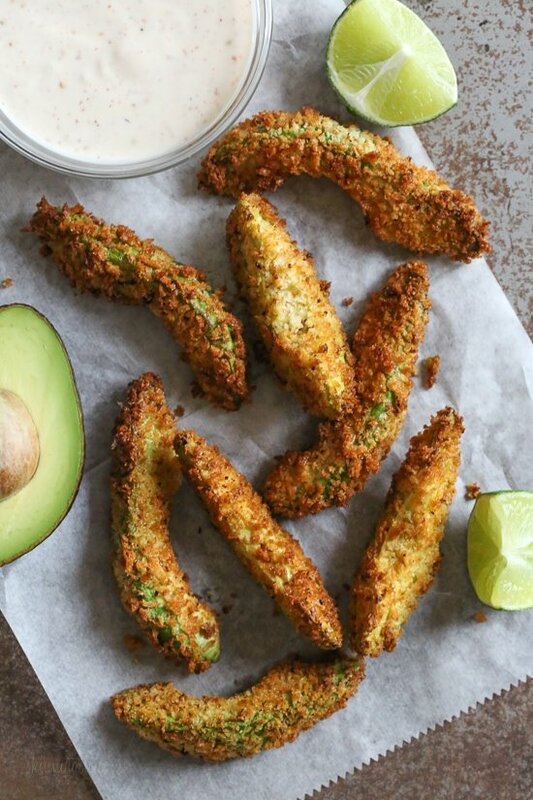 Crispy baked avocado fries coated with panko breadcrumbs and served with a lime dipping sauce. So fast and easy to make in the oven or air fryer! 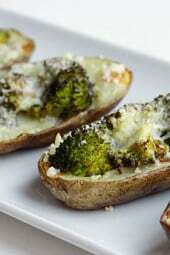 One of my favorite air fryer recipes when I want a healthy appetizer or snack. A healthy appetizer or snack, you can easily make half or quarter the recipe if you are eating alone (perfect way to use up those leftover avocados). 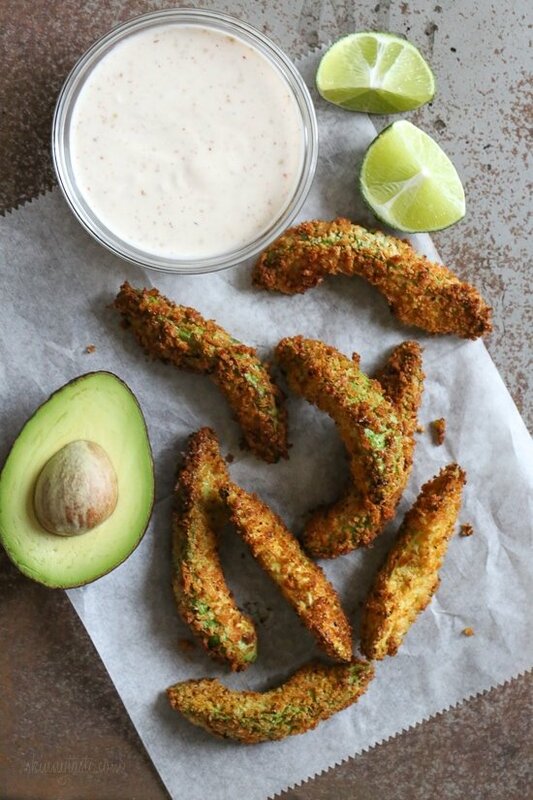 There’s a local restaurant by me the makes avocado fries, which of course they deep fry. 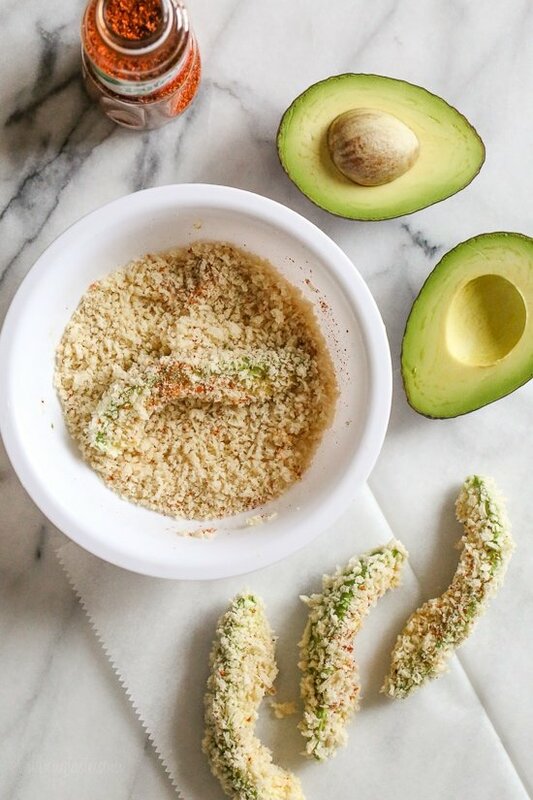 It’s such an unusual way to serve avocados other than making guacamole or making avocado toast (Did you know I have an entire section devoted to avocado obsessed recipes)! So of course I had to make these myself, I tested them in the air fryer and they came out crispy and golden on the outside, warm and soft on the inside using just a few spritzes of olive oil, so much healthier! I’ve also tried them in the oven, they come out fine too. The dipping sauce is a must in my opinion, it ties the whole thing together. 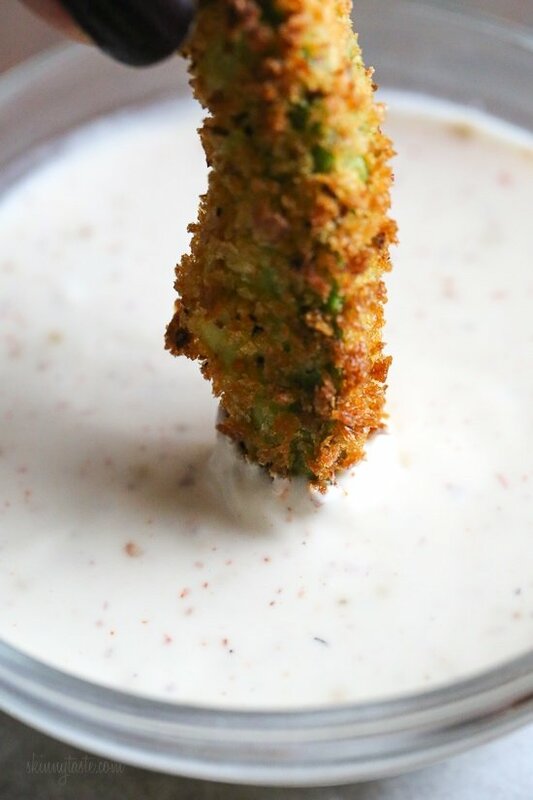 The avocado and lime dipping sauce is seasoned with a chili lime seasoning I am pretty obsessed with called Tajin (affil link) that I think would be a great addition to your spice cabinet, is so good on salmon, tacos, scrambled eggs, steak, avocado toast and even mango or cucumbers! The ingredients are ground chile peppers, salt and dehydrated lime juice, it’s not spicy and has no MSG. I believe Trader Joe’s makes a similar one but you can swap it with chili powder and salt if you wish, you just won’t get the tang from the dehydrated lime juice. 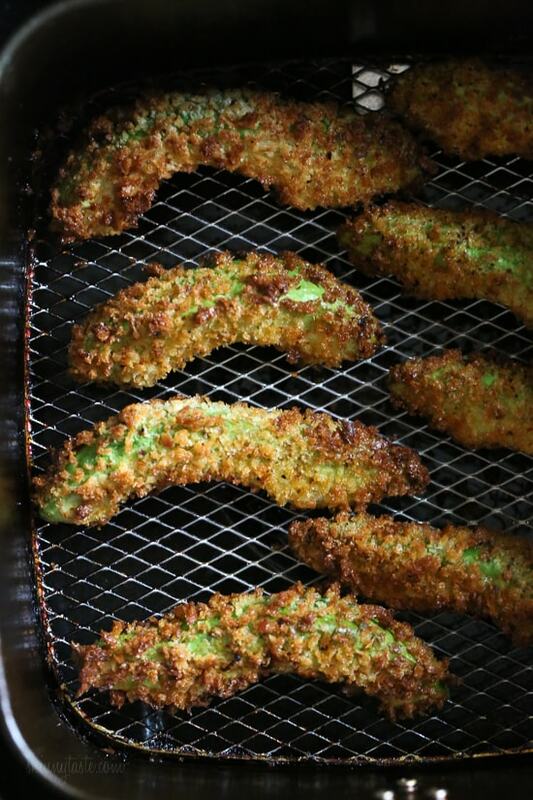 Avocado fries are made with sliced avocado, coated with crispy panko breadcrumbs and air fried until crisp and golden. So easy to make, if you don’t have an air fryer you can also bake them! Preheat the air-fryer 390F degrees. Place egg in a shallow bowl. On another plate, combine panko with 1 teaspoon Tajin. Season avocado wedges with 1/4 teaspoon Tajin. Dip each piece first in egg, and then in panko. Spray both sides with oil then transfer to the air fryer and cook 7 to 8 minutes turning halfway. Serve hot with dipping sauce. Preheat the oven 425F, follow directions above and bake on a sheet pan until golden and crisp, 10 to 15 minutes. I made these tonight as my first recipe using my new air fryer! I am official ADDICTED! They came out so perfect! 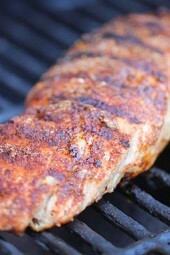 So flavorful, I didn’t have lime chili seasoning so I simply used chili – the flavor of these were AMAZING! There were crispy and crunchy – so perfect! I made these for the second time last night…just as delicious! Thanks for the yummy recipe! I made this in the oven last weekend and they were delicious! Thank you Gina for such a creative recipe? 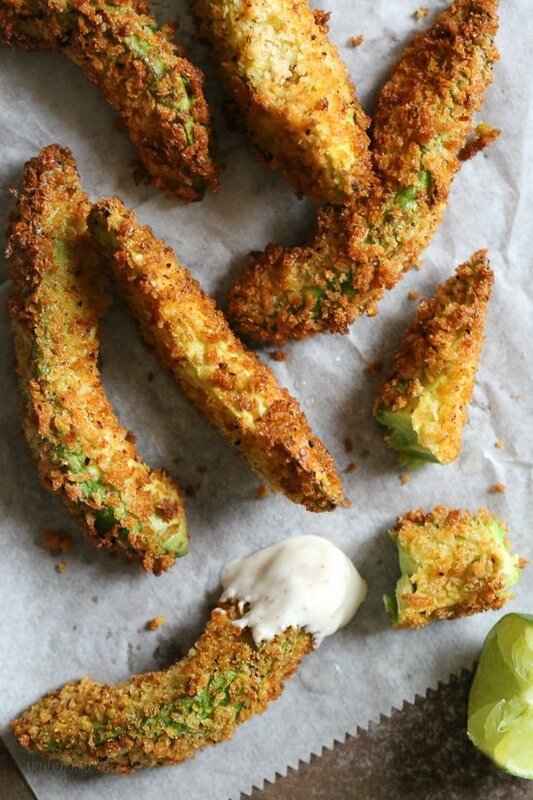 If you’ve ever tried and liked the Avocado Fries from Maggie McFly’s, these taste like those, but are much healthier! Served them with a Morningstar Farms Spicy Black Bean Burger. I didn’t have the spice blend that was called for, so I just blended some Tropical Sazon and a spice mix from Rocco’s Tacos. You could really use any seasoning that you want, though. I also didn’t make the sauce, because I already had a Smoked Paprika Aioli on hand that I had made as a dipping sauce for some Mushroom Empanadas last week. Try the Tajin on watermelon,…it will change your world! Also cantaloupe and honeydew but watermelon is the best. Can you suggest a good air fryer? I am overwhelmed at all the options. Phillips seems to be the most popular and has great reviews. I have one that I got on Amazon called a Zeny and I love it. Just be sure to get the size that will suit you best. I have the mid size and there are two of us. I wish I would have gotten the largest one they make. What is tajin? What kind of taste does it have? I despise mayonnaise. Can you suggest a substitute? Just use more greek yogurt or light sour cream, but you will change the flavor slightly. Should still be good! You could use this as a sub for fishin tacos. We had some in Costa Rica. They were deelish! Can you use the ones that are not quite “ripe” yet? I’m obsessed with avocados! These looks so delicious! I’ve seen a few of your recipes using the air fryer. Curious, do you believe you get your monies worth with that added kitchen tool? Does food taste much better than oven method? Weird question but – what kind of parchment do you use, Gina? I like how they seem to be individual sheets. Thanks! it’s actually paper sheets, not to cook on. I love tajin! I found it at a Mexican grocer. It’s super delicious on cucumbers! My kids gobble them up. Try on a fruit plate with mango, cantaloupe, cucumbers, fresh pineapple and nectarines. My Grandkids love it so do I. I found a package of 12 small bottles you can carry with you of Tajin at walmart. These look great, love avocado! Oh I love avocado’s. Get the small Hass. Get the ones with the skin in between really bumpy and flat (so some bumps on skin with no other blemishes). Then wait until the skin gets dark almost black. When you pick it up it should still be firm but give a little bit when you squeeze. The knife should easily slip in, through the flesh and around the pit when you cut it in half. It may take you a couple tries but once you figure it out you’ll be buying them always! A friend of a friend had a Fuerte avocado tree, and I fell in love with them…so incredibly smooth and creamy and they last much longer than Hass. Sadly, that friend sold their home, and I’ve only see them in a store once, so no more Fuertes for me. :'( I sure hope to stumble across them again someday. So I love avacados when I go out, but I never seem to get them to the correct ripeness for cooking- they are either hard and tasteless or squishy/mushy when I try to slice. Does you have a tip for the perfect time to cut an avocado?? 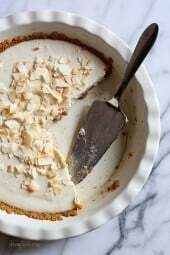 For a recipe like this, seems that getting the right texture is critical! Thanks! My friend taught me to gently push the stem on an avocado. If the stem is pushed into the avocado with little to no pressure, you have a perfectly ripe avocado! Don’t squeeze them in your palm, or get one that is squishy like someone was poking it! Those are usually bruised when you cut them open, even if they were ripe.